Rory and Tom in a Senior Double Scull sent shockwaves across East Anglia last weekend as they scorched to an emphatic victory in the 21.5km Great Ouse Marathon. Not only did they produce the fastest time out of the entire field of 125 boats, but they achieved this by crossing the line in 1 hour 35 minutes, more than 5 minutes ahead of the next fastest boat. 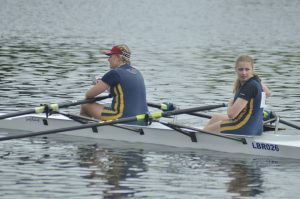 With a strong southerly headwind blowing straight down the course, conditions were challenging for all crews but the Loughborough Double coped with ease and it is highly likely that, on a calmer day, their row would have produced the fastest ever time in the history of the event by any boat. The lighter Loughborough crews simply couldn’t maintain momentum against the headwind, with Cathy and Annie, Beth and Emily, and Hannah and Tilda only smiling occasionally to the cameras. However, there is photographic evidence that Beth still had time to send a few texts and check her Facebook page halfway down the course. But all three crews still managed to press on and achieve competitive times in response to the big challenges of this race. Meanwhile, Tim bravely completed the course in his solo Scull, which is undoubtedly the most mentally demanding of boats for long-distance races: a bit like being in Space, no one can hear you scream. However, Tim would perhaps have improved on his time if he had foregone his Timmy Mallett sunglasses and thereby cut down on his wind resistance. It would also have helped if he had remembered to turn on his selfie video camera before the start….! Even Scott and Mike were not up to their usual peak of efficiency and were unable to generate the controversy that often wins them pots. It is rumoured that they were later heard in the Race Control tent trying to claim that 23 minutes spent by them at The Swan, Littleport, for liquid refreshment and a pie, should be deducted from their overall time. But their story is clearly a fabrication because it is well known that the landlord of the said establishment runs a very strict dress code and would never have served two gentlemen wearing fluorescent pink tops, contrasting stripey socks, and trainers. 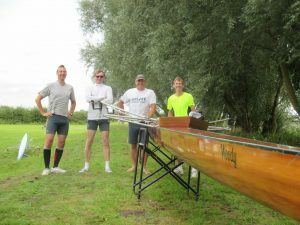 The Masters D Coxless Four fared a little better in ‘Woody’, with a boat more suited to the conditions, as Keith, Charlie, Walrus and Jerry posted a very satisfactory time of 1 hr 45 minutes putting them in a creditable 8th position overall. However, this success was dampened slightly by the headwind robbing them of the chance to post a course record, and also by being narrowly beaten by the notoriously fast Monmouth Four who were rowing in the Masters E category. But on the plus side, Keith enjoyed himself so much he promised to do it again next year and was heard laughing hysterically all the way from the finishing line to the landing stage.